I’m leaving again soon. Not for long but long enough for me to forget the place from which I came. It’s never taken great lengths to do that. The mornings I wake in a different bed deliver me unable to remember who I once was. The days that came before cease to exist and so do I. Then the sun rises. I wish I could tell you of all the ways I tremble at the thought of stagnation. The hungering ache for life’s blood that mirrors the eternal ebb and flow of the ocean. But I won’t. I’m desiring to end with Lilith here. She's the sole thing that’s been of consummation lately. “Do you think they can cure her? Do you know what she wants? Do you think they can cure this fire? She wants to leave the mark of desire on every creature in the word. If she were Caesar, she’d do it with a sword. If she were a poet, she’d do it with words. But she’s Lilith. She has to do it with her body." 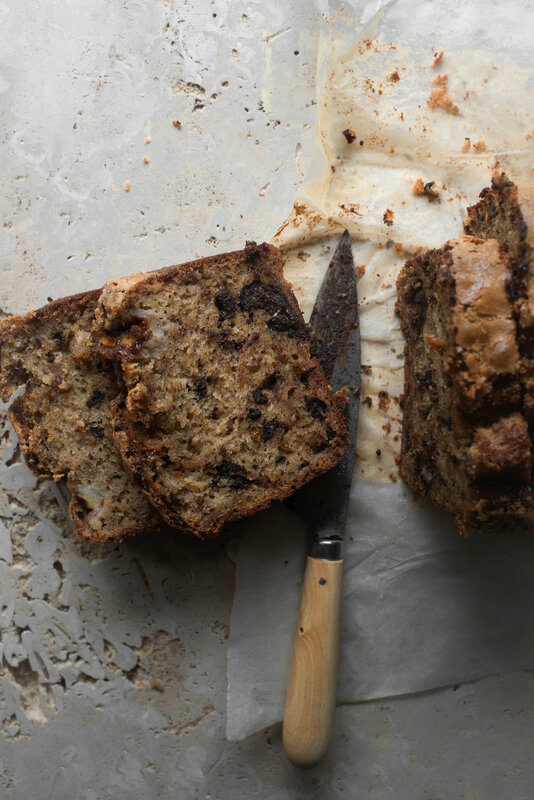 This Sugared Dark Chocolate Tahini Banana Bread is one for remembering. It’s full of sweet character, deep nutty undertones, molten flecks of dark chocolate, and a crisply caramelised sugared top. It’s ultra-moist too. Always make sure to use over-ripe bananas in this recipe which yields a loaf with the most delicious textural character and flavor. Alternatively, if your bananas aren't over-ripe yet, you could set them in the oven to roast in their skins until blackened, then peel and leave to cool before using. Be cautious of not over-mixing! A perfect banana bread is one that’s tender, soft and moist not dense and rubbery. Here, make sure to beat the batter until the flour has just begun to incorporate, some dry floury pockets should remain, then, remove the bowl and finish mixing by hand with a large wooden spoon whilst folding in the dark chocolate chunks. Pre-heat the oven to 180 c (350 f). Grease and line a 23 x 13 cm (9 x 5 1/2 inch) loaf tin with non-stick parchment paper. Let the paper slightly over-hang the sides. In a medium-size mixing bowl, sift together the flour, powder, soda, and salt. Set aside until needed. Add 350 g of the bananas into the bowl of a stand mixer fitted with the beater attachment. Beat until roughly mashed, about 30 seconds. Pause mixing and add in the light brown sugar and vegetable oil. Beat, on medium speed, until light in color and well combined, 3 more minutes. Add in the tahini, vanilla bean extract and sesame oil until incorporated. Add in the eggs, one at a time, beating well after each addition. Set the mixer speed to low and slowly stream in the buttermilk. Add in the dry ingredients and mix until just incorporated, no more than 15 seconds. Some dry flour pockets should remain throughout the batter. Stop mixing and remove the bowl from the stand mixer. Add in the dark chocolate chunks, then, using a large wooden spoon, gently fold them throughout the batter until evenly incorporated. Pour the batter into the prepared loaf tin until it is about ¾’s of the way full. Lay the reserved sliced banana half over the top then scatter over the granulated sugar. Bake for 50 minutes, or until risen, golden brown, and fragrant. A skewer inserted into the middle should come out with a few moist crumbs attached. Remove from the oven and leave the bread to cool in its tin for 15 minutes before transferring it out and onto a wire rack to cool further before slicing and serving.